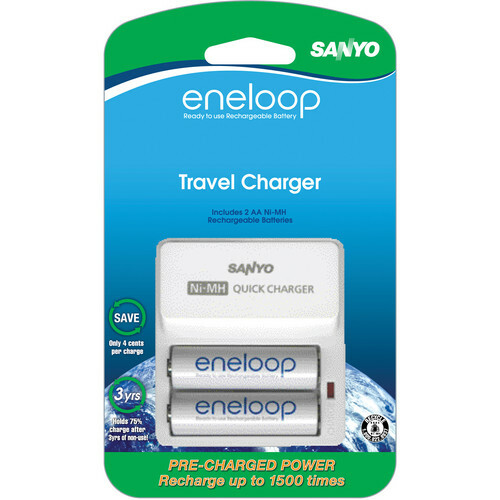 The Sanyo SEC-TDR02N Battery Charger and 2 AA Batteries is a NiMH battery charger and 2 eneloop 2000mAh rechargeable AA batteries. The charger accepts AC 110-220V and features a folding straight US plug for a compact design, making it perfect for international travel. Included are 2 NiMH eneloop 1500 2000mAh batteries. The batteries charge in about 5 hours and are rechargeable for up to 1500 cycles. They are ready to use out of the packaging, retain their charge for up to 3 years on a single charge, and have no memory effect. NiMH battery charger accepts AC 110-220V input, allowing for international use. Compact design with folding US plug. Includes 2 2000mAh rechargeable NiMH AA batteries. Average charging time is about 5 hours. Box Dimensions (LxWxH) 6.0 x 3.1 x 1.1"
SEC-TDR02N Battery Charger and 2 AA Batteries is rated 4.0 out of 5 by 1. Rated 4 out of 5 by Tim from Charger works well, but for AA only I use this on the road for the rechargeable AA Eneloops I use in my speedlights. Works fine. However, it does NOT accept AAA batteries, as does the 2-position quick charger described on the Sanyo website (model SEC-MDR02TG3U). Perhaps a model change? Yes, there is an LED indication light that will illuminate during charging.